Hark the Herald Angel Sing! ...and he's not the only one! My Secret Santa keep the mystery going for those vital extra seconds. Mrs Kinch and Cousin Basil got great entertainment from my reaction to this at the breakfast table. British armour - thank you Secret Santa! My apologies for my laxness is posting for the last few days, between work, family and other writing commitments have kept me from my blog. I have always liked the picture above. It represents the light that this time of year and the event it commemorates brings to the lives of ordinary folk like you and I. The adoration of the Magi, powerful men, leaders amongst their people, will come later. My King is no respecter of persons and those who came to him first were ordinary men, as practical as potatoes and as simple. 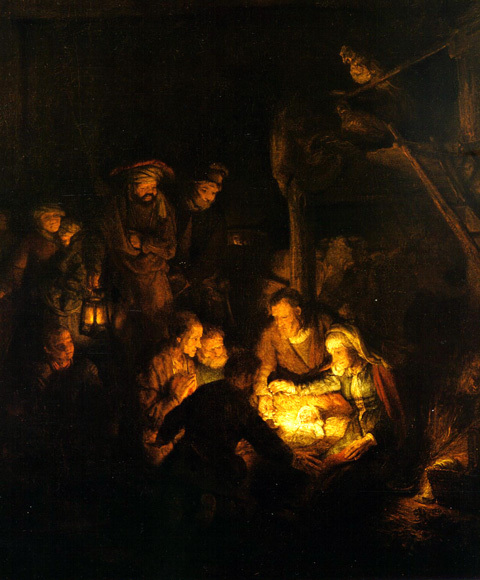 Say what you like about that Rembrandt fella, he knew how to paint light. Mrs Kinch and I saw this painting seven years ago, the day I asked her to marry me. It is as magical now as it was then. Enjoy the feast and raise a glass for me. I hope to spend a quiet day in work tomorrow, so if you do raise a glass, don't get behind the wheel of a car, because that will definitely spoil my quiet day or the much hoped for quiet day of others. Mrs Kinch and I, Cousin Basil, Sissi and Flashman would like to wish you all a very Merry Christmas and peaceful and prosperous New Year. Yesterday was a wonderful day, in fact, I'm running out of superlatives. One of the best nights in work in months - robbers captured, damsels rescued, crises averted, conflicts soothed, wrongs righted and all back home in time for tea with no-one needing a trip to the hospital. One of those shifts that remind me why I joined. Just great. Back home for some sleep and then up again to get to the 15.15 carol service at Saint Patrick's Cathedral. It was a great service with three differant choirs, wonderful reading and a wonderfully rumpty-pumpty-pump rendition of "God rest ye Merry Gentlemen." Mrs Kinch is quite right that I don't have two notes to rub together, but there's something about singing in church that lets me forget that I'm an awful singer and just wail away. The turnout was impressive, Cousin Basil who came along with me was quite surprised, though the unkind might attribute that to the fact that the Mothers Union bake sale in aid of the choir was afterwards. They are formidable women and not to be messed with. Cousin Basil and I repaired to a local hostelry laden with cakes, cookies, mini-puddings and all manner of good things. A quiet pint with Mrs Kinch after her work and then home again for a nap and back to work for me. In wargaming news, my gift from the wargaming Secret Santa arrived a few days ago and is now ensconced under the tree. Mrs Kinch had been detailed to open the package and wrap the gift, but discovered that Secret Santa had already done the job. I had been looking forward to this - but judicious shaking, poking and rattling leads me to believe that it is either a tennis racket or a banjolele. The disappointment was so crushing that I had to take solace in song. So I'll leave you with Mr B - the Gentleman Rhymer's "Oh Santa!" As I said previously, there's been precious little wargaming going on in the Kinch household of late. I'm still emptying the war room, though the wood is now ordered and will be delivered next week. However, the Russians are coming and I've been doing my best to be prepared. I've been reading Digby Smiths' book on Borodino, which while well written makes for awful reading. Perhaps I've been reading too much about the Duke and he was not without his faults, but he was commendably abstemious with life when he could manage it. Borodino reminds one of a small boy crashing toy cars together for the fun of it. 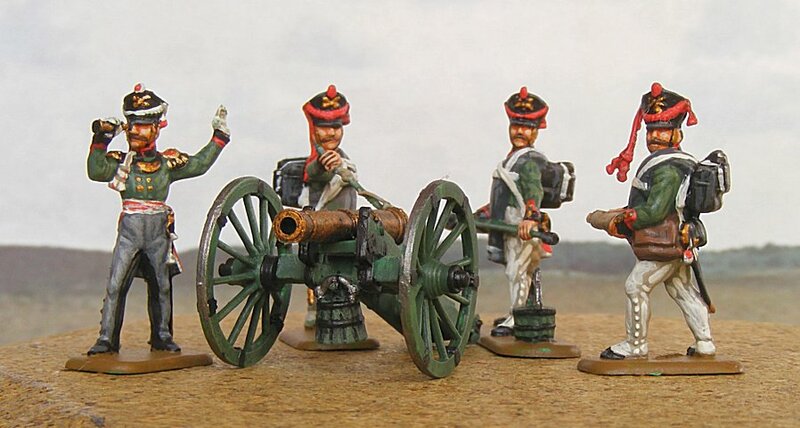 With that in mind, allow me to present some gentlemen of the Russian foot artillery. 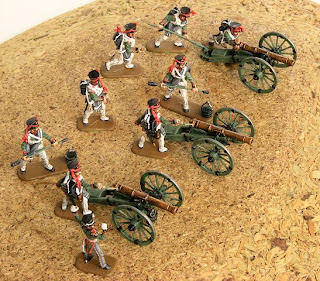 These are Zvesda figures, painted by Krisztian Takacs of Budapest, and very beautiful they are too. The Russian artillery was in poor shape at the beginning of the Napoleonic wars - but was reformed under the ultra-conservative General Arakeev. 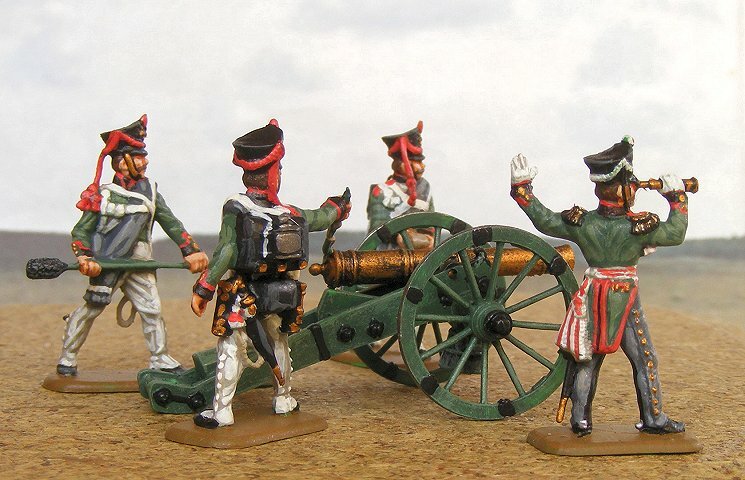 Arakeev was a martinet who frequently used his professional position to pursue personal vendettas, but he introduced standardised calibres and other reforms into the Russian artillery which made it very formidable indeed. Once my MDF bases from Products for Wargamers arrive I'll get these chaps based up, but until then they'll have to carry on living in a box. These pictures were actually taken by Krisztian, who sent them on to me a few weeks ago. Stealing other men's glory, what! 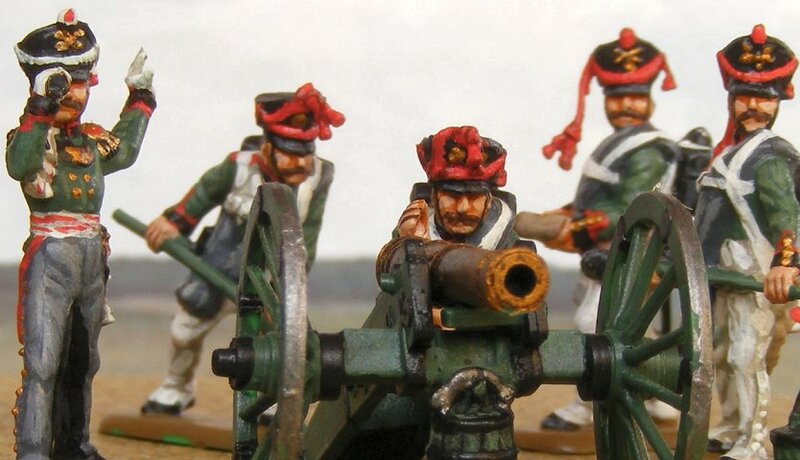 The last thing many Frenchmen ever see. I am blown away by how fine the detail on the Zvesda figures is and the fine job K did bringing it out. I think it's also rather fine how well the crew fit together, there is a definite sense of what is occurring here, rather than the old ESCI standing around with a bucket looking decorative situation. 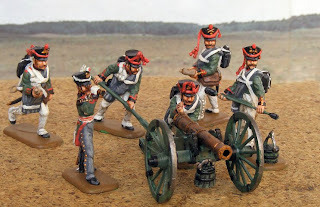 In the Russian service, guns were served by a team of gunners split into two parts, the cannoneers (or gunners proper) and the "long arms", chaps who brought a strong back, but little else to the job. Of the cannoneers, there were four. No. 1 carried the swab. No. 2 carried the charge. No. 3 carried the slow match. No. 4 carried the tube pouch and prickers. I'll leave you with some up close pictures of the gun crew. There's been quite a bit on the last few days. My latest X-Ray is clear which is very good news and I'm finally back at work which is a relief. Admittedly, the bit where I viewed the work that had piled up in my absence was less than pleasant, but it's good to be back. Christmas has been in full swing in the Kinch household for the last few days. I tend to get my Christmas shopping done relatively early in the year (July I think this year), which was a hangover from my time in retail, which means that beyond a few bottles of wine, there isn't much for me to do. One of the most wonderful things about having your own home is bringing home the Christmas tree - it marked the beginning of the holiday season for us. The house is redolent with the smells of pine and baking. Mrs Kinch is a woman who observes a strict division of labour with regard to Christmas. Baking, decorating and so forth are girl jobs. Getting and setting up the Christmas tree, unpacking and setting up the cribs and so forth are boy jobs. Which reminds me, I have to make a backdrop for our crib - a job for tomorrow I think. That rare moment where my modelling skills have a real world application. There's been precious little going on on the wargaming front. I took delivery of some painted figures from Krisztian, pictures to follow soon. 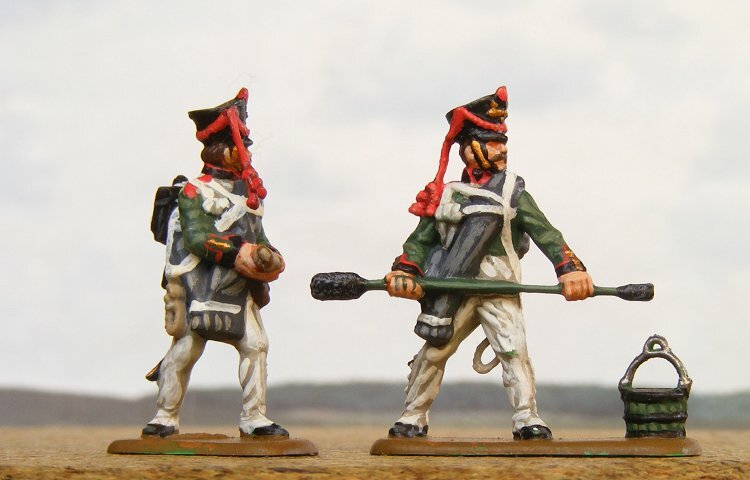 With much of my efforts revolving around Command & Colours Napoleonics, this is sort of a general project to improve the look and feel of the Grande Bataille version which I take to conventions. None of this is exactly critical, but I hope that it will make the game more of a spectacle and aid gameplay. - Improved playsheets. I'm considering bespoke playsheets for the individual battles and ones summarising the Grande Bataille rules we've been using. Also maybe a little sign explaining what we're doing. - Some diorama elements. One of things that really blow my socks off about the Wild Geese games are the little diorama elements that they add to their games. I have some bits and pieces, but I'm thinking of adding a few more. This has the added value of drawing people in to look at the pretty toys. Johnny keeps wittering on about more flags. British soldier peeing against a tree. Two French officers (with seconds) having a duel ideally looking a bit like David Carradine and Harvey Keitel. A soldier fleeing the scene of the crime with chicken. Cats asleep on roofs, ducks on the river, that sort of thing. As regular readers will be aware - the Russian expansion is due in the first quarter of 2012. I'm not to flustered about this as there are a lot of Spanish games to be played before we can really get stuck into the Russians. That said, there is a lot ground is covered comparatively speaking, most of the figures have been got and the infantry will be heading out to Mark as soon as bases arrive. I have after long cutting my own front plasti-card become a convert to the MDF bases available from Products for Wargamers. Jim is a gentleman and I can't recommend him highly enough. With at least another three or four months before we see the game, I'm happy that I'll be close to completion relatively soon after it arrives. That is probably terribly optimistic. Things to do: Get the infantry to Mark. I have all my infantry bought and most of them based for this particular project. HAT do a very comprehensive range of Austrians and they've filled almost all the slots. 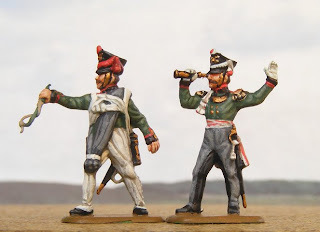 Cavalry are the only arm I see presenting a problem, but to be honest - I'll have so much Napoleonic goodness to wade through before then it hardly matters. There are any amount of good hussars to be had and a unit or two of Austrian heavies in metal will hardly break the bank. Unfortunately, my HAT chaps are all in those dull shakos, rather than the more elegant helmet. We have been promised the Prussians before the end of 2013, but I think 2014 is more likely. The HAT infantry are excellent, though they belong very much to the latter period. The HAT chaps in bicornes are awful. an England Invaded game set in the 1970s - a mixture of "Went the Day Well" and Invasion 1999 using Savage Worlds, though I think we've a while to go yet. Things to do: Urban guerillas and some appropriate terrain. Sharpe Practice has been an on and off idea for the last few years. The miniatures pose no problem, my existing Napoleonic collection is all single based. I have the rules and "The Complete Fondler" scenario collection. Looking through the scenarios listed there are some pretty big ones, doable but I think they will require a certain rethinking of how I use my terrain. Things to do: Prepare blinds and a card deck and play some games. All of this is of course, predicated on my getting better and getting the war room floor fixed and getting that done before Christmas is looking increasingly unlikely. Looking over at the list of projects - they can be broken into three main groups. It's plenty of stuff to be getting on with, but I don't think it's likely to break the bank or leave me frustrated with lack of progress. I think the key here will be "little and often" and to play lots of games. It will be six months at least to play the Hundred Days and finish the pith of the Spanish scenarios. There are a lot of good things head. 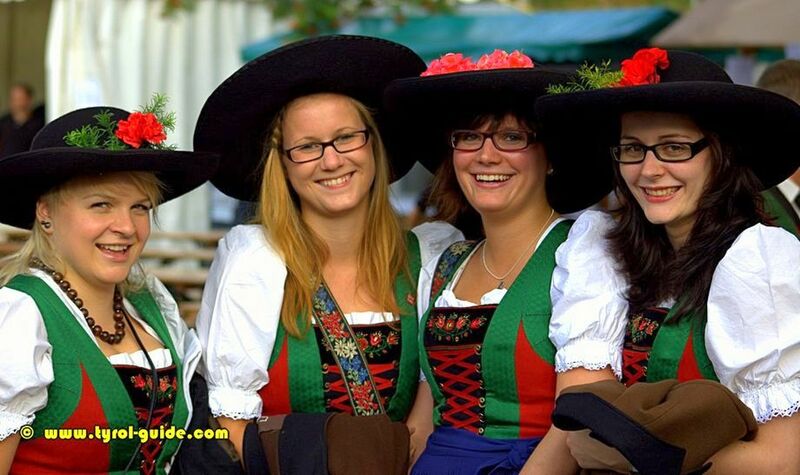 *Do not, my friends type Prussian girl into google image search, you will find some pretty odd stuff. Mrs Kinch: I'm terribly sorry darling, but if you were a horse Papa would have me shoot you. Cousin Basil (adjusting his moustache): Come along old girl, it doesn't do to watch 'em linger. Feeling a bit more uppish today and went looking through old blog posts trying to find the post I wrote when I had swine flu, which I caught under similar circumstances two years ago. While I was at it, I came across an interesting post where I did one of those ill fated "Five Year Plan" efforts. I thought it was interesting to look back at it and as I won't be doing anything blog worthy for a while, it gives me something to write about without being too demanding. On the subject of Five Year Plans, I've always rather liked this song, much as I disagree with his politics, the man himself seems both decent and genuine. The following projects were listed. This can only be described as a roaring success. I've played this game solidly for two years and it is still offering me new things to do and be interested in. When I wrote my original post, I was waiting for the box to arrive. 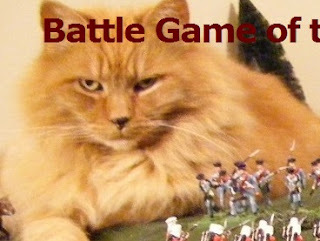 Since then I have completed British and French armies for all the scenarios in the basic box. We've played every scenario in the box (barring Waterloo and Quatre Bras which are being saved for a special occasion) and several more besides. Gentlemen, I present my Battle Reports page as evidence. I defy anyone to say that this particular project was not a roaring success. Things left to do: Play Quatre Bras and Waterloo with General Creanor while drinking bottle of 1984 Port. Oh, Goya, why you so serious all the time, huh? A few months ago I would probably said that this project was a qualified success - but I'm upgrading this to full aircraft carrier and "Mission Accomplished" banner status. I've raised forces to cover all the scenarios and we've given several of them a whirl. There are still things to be done with this project (mainly due to jaw dropping generosity of a friend of mine who sent me a ton of figures), but the brute work is done and all that remains is to play the games and enjoy oneself. 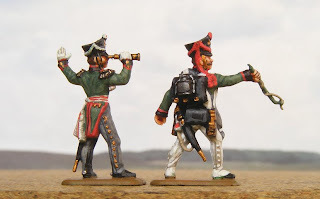 Things to do: Nothing really, three units of Swiss infantry in Spanish service, who are already with Krisztian. Play more games. This was a nice idea, to set up a wargaming imagi-nation that I would use to play Charles Grant scenarios in. I bought figures for it and that's pretty much where it ended. Those figures have either been sold, given away or inducted into other forces. To be honest, I think the main reason this project floundered was that I was having too much fun playing historical games with historical forces. I've also noticed that the really dedicated Imagination fellas tend not to play that many games and spend most of their time painting. That said, I have had considerable success* with a series of LARPs set in the Grand Duchy of Little Siskington and the Bishopric of Gormanstein over the last few years, so this is obviously the outlet for my Imagi-nation needs. I quite liked this game when I first got my hands on it. However, the War of 1812 has never been a big period of mine, mainly I suspect because I get confused when I see Americans fighting the British. Also invading Canada also strikes me as the act of a cad - I've never been there, but the people are wonderful, just so incredibly lovely. How could you? I think this project was on the list because at the time of writing the game was actually available and I already had all the British troops I would have ever needed. I still have a horde of unpainted British troops ready to be transferred to Cousin Jonathan's service, there just seem to be other projects that keep crowding ahead of them. Curiously enough, this project despite being no-where near where I want it to be has actually made considerable progress. 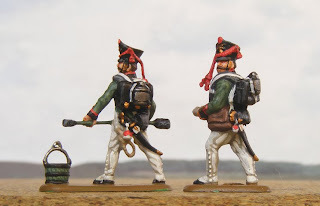 I have sufficient British troops and sepoys for my immediate needs, though sepoy cavalry is a little thin on the ground, though I hope that the estimable Uwe will soon put that to right. The forces of Kaala-Akaata are formidable. They will probably require some more peon infantry, but for the most part things are taking shape. The rules have been play tested by General Du Gourmand and I and they seem to be sturdy enough. The forces of the Rajah play sufficiently differently to the forces of the company for it to be interesting. The terrain is done as I have a nice collection of Indian building, including a mosque, though I should presumably invest in a village well and some 'eathen idols. Funnily enough, I was having a look at the vegetation in the Carnatic and it's very European to my eyes. Given that Kala-Akaata owes rather more to my childhood reading of The Jungle Book than my adult reading of Jac Weller, the vegetation will be more jungly then strictly necessary. What I actually want to do is to run this game as a "group solo" effort in the style of Howard Whitehouses "Too Much for the Mahdi" - but with Command & Colours for the battles. I've had difficulty coming up with a logistics game that I'm really happy with though. There are other projects occupying my time at present, but this is something I will definitely come back to. Things to do: Add a few troops here and there, write some proper rules for logistics. I only really started into this project a few months ago, but we've made considerable inroads into it already. We've played about half a dozen games as well as one very odd solo effort. The main difficulty has been fielding a suitable force against the Germans as I have rather a lot of them, more than I have of anyone else. 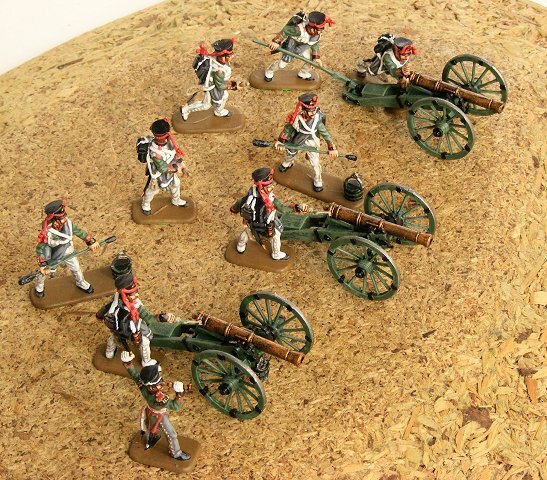 Once I'm finished my Russian guns, the Russians will have tanks, infantry and artillery enough for several games. The US and the British will not be far behind, but I intend to take this one at a fairly sedate pace as there are hundreds of Memoir '44 scenarios out there, most of which can be played with twelve units of infantry, six units of tanks and three units of artillery. I think what I'll probably do is pick one of the two player campaigns from Campaign Books 1 & 2 and pick my forces accordingly. Things to do: Simply hundreds, but I'll take them as and when I like. This was to be my effort at a Very British Civil War game. I actually did a bit of work on this and then forgot about it. I was mainly an excuse to play some "What if" Memoir '44 games without having to think to hard about actual practice during the Second World War. I have a few of the Solway Arts pamphlets and they didn't impress, which killed my enthusiasm for the project rather. That said, I wouldn't have to add much to my arsenal to play some games and the "What if" element remains. Though I should clarify what I mean by "What if", I'm not particularly interested in the exploits of the Borsetshire Workers Flying Column or the Ambridge Black Shirts, but I am interested in is "How would I go about taking a fortified town with a mixture of horsed cavalry and tanks." VBCW offers the chance to do that without getting yelled at. Don't ask me why I don't play the Spanish Civil War, the God awful slaughter depresses me deeply, and I can't give you a good reason why the Eastern Front doesn't have the same effect. Things to do: Not much really. I have the majority of the figures I'll need. This is a - wouldn't it be nice to try - sort of effort. I might push on with it a little, but it will only be if other projects aren't engaging my interest. This was a game that Capability Savage and I ran nearly ten years ago. Two years ago, we were rather tired and emotional and got to talking over old times and setting the world to rights. We were unfortunately in the company of that unscrupulous bounder Donogh McCarthy, who challenged us to do a second and improved version of the game. It was a nice idea and we were initially enthusiastic. but in the end we weren't sure that the effort required would be worth the payoff. Though of late, I've had fond memories of game of Rogue Trader - I don't think I'll be returning to the 41st millenium any time soon. In conclusion, I think I've acquitted myself reasonably well. The aborted missions are no tragedy and I didn't put much time or effort into them. What money I put into the Ruritania project, I've made back by trading or swopping the figures and the material I wrote for it was folded into the Little Siskington LARPs without any trouble. The discretionary missions are nice ideas and I may do some work on them, if the mood takes me. But unless something comes along to give me a kick in the backside, I'm unlikely to finish them - not when there are exciting new Napoleonics to be had and other projects that have come up since then (a subject for a second blog entry I think ). The missions commenced are a mixed bag - I'm coming very near the end of the time when I'll be buying new stuff for India, bar a war elephant or two. I want a suitably dusty hex matt, though I am led to believe that Mrs Kinch took my relatively unsubtle hint**, and that this may be appearing in the near future. Unfortunately for India, the game I want to play there strikes me as one that requires a lot of time and a solid logistics game and I'm not sure I'll have to time to arrange that for a while. As for Memoir '44, I could spend the next five years trying to build collections to play it and still not be finished. But I can, if I (quite literally) choose my battles carefully, add a few pieces to my collection and get plenty of games out of them. I'm in no rush. Missions accomplished - there's not a lot to say about them other then the fact that I'm tremendously happy with C&C Napoleonics as my game of choice at present. When I think about the sheer number of games I've managed to play in the last two years, I consider myself very lucky. Our two Grande Bataille outings have been very successful, though I look forward to Richard Borg's final word on the matter. There is also the happy prospect of getting stuck into Waterloo and the Spanish. I think I may have to begin a new battle reports page. *Where success is defined as having fifteen or twenty people turn up play the game and wish to repeat the experience afterwards. **"Darling, I want this for Christmas. This is the link you need to click on and this is the thing you are to order, exactly this thing, accept nothing else." 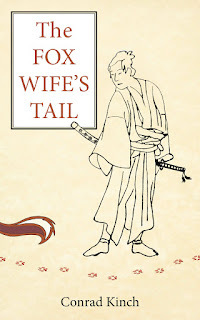 Women are such subtle creatures and often pick up tiny and often quite unconscious clues. One of the best things about my profession is the people that you meet. Sadly, it is also one of the worst things about my profession. I picked up a cough from a chap I met in a professional capacity last week and in my attempts to soldier through it, I have apparently given myself pneumonia. This has laid me low the last few days so my apologies if my correspondence has not been as snappy as usual. I had hoped that at least this enforced bed rest would allow me to get some scribbling done, but I seem to have precious little energy. The lack of a War Room is really beginning to bite at this stage - I haven't had a decent game in nearly a month. That should however, be ending fairly soon and I'm very glad too. With that in mind I've been thinking about what sort of games I should play next. I've had a hankering for an old fashioned figure removal sort of game for a while. I was considering the Legends of the Old West Alamo game, as I'd rather like to do a siege - but then I thought I might give Sharpe Practice a try. I bought it a couple of years ago, but never actually tried it out. Unfortunately, when I went looking for my copy I discovered that all my Two Fat Lardies PDFs had gone in a hard drive crash last year. One swift email to Richard at Two Fat Lardies later - he did a check on my account and sent me copies of everything that I was missing. Strictly speaking he didn't have to - but it did so anyway. So hopefully, once the interminable floor project is done, you'll be seeing some Sharpe Practice in the weeks to come. *Photograph may not actually be Richard Clarke. This guarantee is not a guarantee.